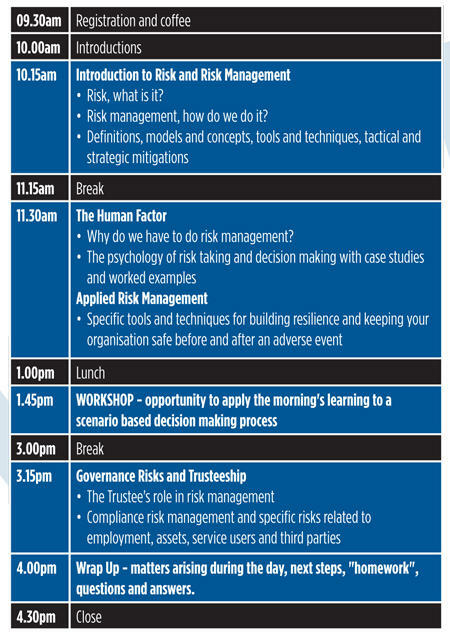 This course is a non-technical introduction to risk and risk management for trustees. Stephen McAndrew is an experienced consultant and advisor who works with charities, public services and businesses to understand and manage the risks that they face. He spent 10 years developing and implementing risk management and patient safety programmes in the NHS in the UK, and state health and care systems in Ireland, New Zealand and Australia. For over twelve years he has served as a trustee of a number of charities where he has successfully applied risk management to improving safety, quality, sustainability and organisational resilience. He is currently a trustee of Rethink Mental Illness. This course was full of useful information and a good foundation for future board action. Good pace, appropriate material and plenty of opportunity to ask pertinent questions. All trustees should attend this course as an introduction or refresher to their role. Having just moved out of managing risk in the business world, I found this course excellent to put this into a third sector context. Very relevant and enjoyable.